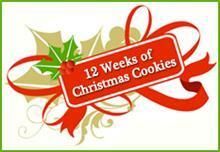 Welcome to Week #3 of Twelve Weeks of Christmas Cookies brought to you by April of Abby Sweets. A few months ago I visited a friend's blog and she mentioned making Sugar Cookie Bars:) I had never heard of them, and emailed her right away asking about the recipe. She sent me the link and I printed the recipe. I never got around to making the bars...until today! We are getting ready to leave on a weekend camping trip tomorrow to Big Sur, so this uncomplicated cookie bar recipe came in very handy. It's a snap to prepare...mix everything together, spread the dough in a baking pan, throw it in the oven and TA DA, you have some delicious sugar cookies in bar form. Slather on some buttercream frosting (or whatever you prefer) and finish it off with some sprinkles to add some holiday flair. Of course you can leave the bars plain, or just bake them with the sprinkles only. These bars are delicious and addictive! Just remember that it's better to underbake them. I wish I had pullled them out of the oven at 10 minutes instead of giving them an additional 3! The bars in the middle of the pan baked up just right, but the outer edge bars turned out a teeny bit too dry (The frosting compensated for that though). Next time I'll get it right, and you can be certain, there will be a next time! These sugar cookie bars are all over the internet, but this recipe is from the blog: One Ordinary Day. Cream butter and sugar until fluffy. Add eggs, one at a time, mixing after each addition. Add vanilla and mix well. In a separate bowl, combine flour, salt, and baking soda; stir with a whisk to combine. Add dry ingredients to wet ingredients and mix until just combined. Spread into a greased baking sheet (approx. 13×18″). Bake at 375 degrees for 10-15 minutes, or until golden and a toothpick inserted in the center comes out mostly clean. Cool completely and frost with your favorite frosting. To make the frosting, place the butter in the bowl of an electric mixer. Beat on medium-high speed until smooth, about 1 minute. Blend in the vanilla, salt, and confectioners’ sugar until smooth, 1-2 minutes. Mix in the milk. Tint as desired with food coloring. Spread over the cookie in the pan, cut into bars and serve. Can I tell you a secret? I decorated half of the pan for Halloween:) Shhh...don't tell anyone. I just came over from 'My guide to surviving and enjoying lifes mundane' blog and wanted to say hi after reading your comment about 'commercial baths'. Very funny. Very clever. THose look so easy and delicious. Uh oh guess what might be next week's cookie? LOL! Yum! I must know where you got those giant Halloween sprinkles. Those are so fun. They look delicious! What is better than simplifying the rolling out mess of sugar cookies? I love the half and half sprinkles, too! LOVE these bars Sue! Nothing better than a wonderful sugar cookie...it's considered a "comfort food" for me...and then make them into bars! - oh HEAVEN! I adore how you let us in on your secret of decorating 1/2 the pan for xmas and the other 1/2 of Halloween...priceless!!! Have a wonderful time camping this weekend! I love that you decorated half for Halloween. I wanted to package mine up all pretty but I just couldn't pull out the Christmas Stickers. I love your bars because I mean, really, who doesn't LOVE a sugar cookie? I know my daughter was just asking me to make some. These are so pretty! And I love that you decorated half the pan for Halloween, hah! I'm dying to try these, they look wonderful and I would definitely be putting buttercream frosting on top. Yum! I've never eaten sugar cookie bars either and now I don't know why when I've heard time and again that they're so good. I guess now is the time to finally try them. They are so pretty too, bookmarking. I love sugar cookies but seldom make them (always for Christmas) because they are so time consuming. What a good recipe to have. Thanks for sharing. Love the halloween colored decorations! Sue, I love these colourful festive sugar cookies! They bring the happiness! These look great! And so festive! Sugar cookies are the best! These are so festive. They could be used for birthdays or holidays and you go girl with Halloween and I won't tell. This sounds like a great holiday cookie recipe! oh boy, these look waaaay too easy! LOL!! What a fun, quick treat to make. Easy to dress up for any occasion, too. I have never made these and they have bookmarked forever. There is now a need for them...Need, want..whatever..must have them! Those would be perfect for the pet-adoption day my daughter is doing for school. Who can resist sugar cookies, in bar form? I love how you decorated half for Halloween - that made me laugh. LOL, i wont tell! what a versatile cookie! thanks for ur comments on my hedgehogs earlier! These look so pretty and festive ... and its great that you can customize it for many occasions! Wow these are perfect. Love the sugar cookies, hate the hassle and these are a perfect way to conquer that. Okay, I am totally bookmarking this... the Halloween OR the Christmas version looks totally awesome! Thanks for sharing, and thanks for stopping by my blog! Sugar cookie BARS?!? Yes, please! Yum, cookie bars are sooo good and you managed to make them Christmas and Halloween, nice work your secret is sage with me (and the entire blogoverse). Look so easy, and delicious! Perfect for a Christmas or a Halloween treat! I have seen these all over but have never made them, I think I may have to now! Mmm, sugar cookie bars are my favorite! I love how you decorated yours. Love that frosting on top. We love to have a thick frosting on top of our treats also. I love that you decorated half for Halloween - too cute! They sound yummy! What a great idea! So simple but gorgeous! I love the festive sprinkles! I was just thinking these would be cute for Halloweentoo and then you surprised me! Yum. I thinks these are such a great idea! and so fast to make! Thanks for the recipe and all of your nice comments! What a time saver these are! I have bookmarked this to make soon. These look so good. Did you bake them in a disposable pan? At what point would you freeze them, after baking but before frosting? Sue I can't wait to get baking. I'm not supposed to be this excited yet. I'm going to go through your cookies and pick some to make this season. Thanks for sharing this great recipe! It was so easy to put together and my family loved it. Little man (who is 1 now) went totally crazy when I let him try a bit and kept going back to the kitchen to get more ... was really cute!